Britain is a nation of dog lovers, so they say, and that was certainly true of one nineteenth century family living high up on a remote edge of the Yorkshire moors: the Brontës. Emily and Anne Brontë, the two youngest children and always so alike in character, were especially fond of animals, and throughout their all too short lives they would have a succession of pets, many of which started off as wild animals they had found injured on their beloved moors. It was dogs that they cherished most of all however, and the two most famous Brontë dogs show one difference between Emily and Anne. Emily had Keeper, a mastiff that was intelligent, fiercely loyal, and yet could be very aggressive when cornered. Anne had Flossy, a black and white Cavalier King Charles Spaniel who was gentle and loving, yet could be strong willed too. As often found, these dogs were reflecting their owners’ personality. In June 1843, Anne was given the young Flossy as a present by the three Robinson girls she was then serving as a governess. This is testament to how highly the Robinson children rated their kind and quiet teacher, as was also shown by the many letters they later sent to her and their visit to Anne in the winter of 1848, just months before her death. Anne fell instantly in love with Flossy, and she would often accompany her mistress on walks across the Haworth moors, although she sometimes got a little distracted and ran off to indulge in her favourite hobby of sheep chasing. Flossy would later become a mother, and one of her puppies was given to Ellen Nussey, who also called it Flossy. The Brontë Parsonage Museum at Haworth holds two sketches that Anne made of Flossy, both unfinished possibly because Flossy never stayed still long enough to be painted. The picture at the top of this blog was once thought to have been drawn by Charlotte or Emily, but expert analysis has now proved it to be by Anne. Emily certainly did, however, draw Flossy in all her glory, shown below, which shows how much she had captured the hearts of the family as a while. Emily’s last act, on the night before she died, was to feed both Keeper and Flossy, even though Emily was by then so thin and weak that a sudden gust of wind coming under the door blew her off her feet and against the wall. Refusing help, she slowly regained her feet and fed the dogs. In May 1849, Anne had to take her leave of Flossy one last time. It is said that she cradled and cuddled the dog which was passed to her in the carriage waiting to take her on the first leg of her trip to Scarborough in search of a cure for consumption. The carriage that Anne, and all others, really knew was taking her to her death. It’s easy to imagine how hard it must have been for Anne to say goodbye to the dog she had loved so much for nearly six years, the dog she had whispered secrets to that she would tell nobody else. As always, she faced this dreadful moment with calm courage. Flossy was to outlive Anne by another five years, although all her life she would often look around for her mistress. She was looked after by Charlotte, and often taken for walks by the assistant curate Arthur Bell Nicholls, who for some reason was very keen on doing anything he could to help Charlotte. She reported Flossy’s death to Ellen, saying that no dog had had a better life nor a gentler and easier end. 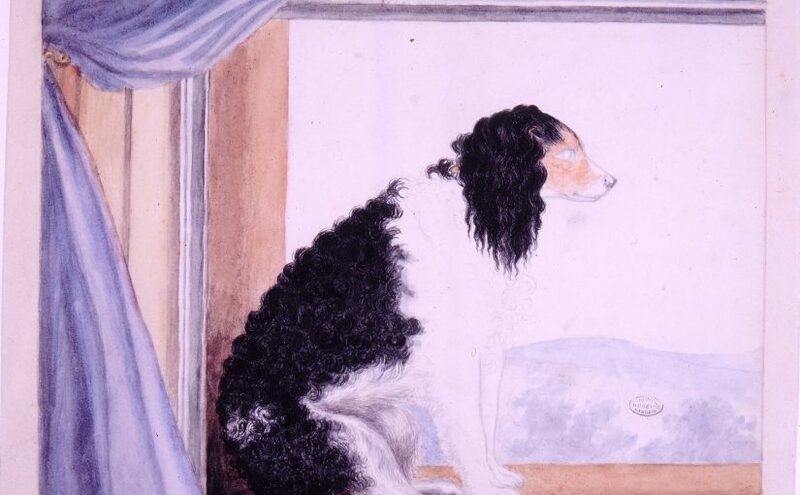 It’s a fitting tribute to a pet who must have brought so much joy and happiness to Anne Brontë, a woman was not to know too much of either of those commodities. 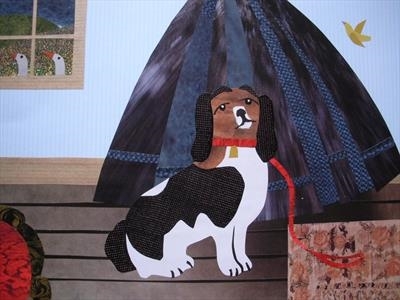 Last year, I was fortunate enough to purchase a collage showing Anne Brontë and Flossy, made by the incredibly talented artist, and Brontë lover, Amanda White. It also contains three other Brontë pets, can you spot and name them?